Kamla: This is Kamla Bhatt. Reid: Very glad to be here. Thank you for having me. Kamla: How big is your rolodex? Reid: My rolodex? I think it’s about some 1720 odd connections on LinkedIn. Kamla: What did you use before you started using LinkedIn as your rolodex? Reid: Well I’ve always been an electronic person. So in the early days it was Palm. Reid: Before Palm just e-mails. c8674bcc-b92e-11dd-8798-000b5dabf613.flvNothing other than e-mail, I think. Kamla: The LA Times earlier wrote an article and they described that LinkedIn is a clone of your brain. It is a manifestation of how Reid’s brain works. How did the idea of for LinkedIn start? Did you have a formal business plan? Reid: Actually in Silicon Valley, we don’t do formal business plans. We do 20 point slide PowerPoint deck. Because I was fortunate to have made a little bit of money from PayPal, I financed the money for the first ten months myself. And so I don’t have to construct the PowerPoint myself. I just went, ‘Oh, I think there is something here.’ Now the highline was, I believe that the internet is going to be extremely important with how people manage their work and careers and that everyone is going to have a public profile on the web. That is, a professional profile and that how they accomplish things will be central on the internet. Those were the kind of founding ideas which drove into the specifics of what we built LinkedIn into. Kamla: So you were lucky.b8753b36-b79c-11dd-87a7-000b5dabf613.flv You had money so you were able to fund the start up. Kamla: Tell us; is it a clone of your brain? Reid: Well if it is a clone of my brain -- we have a lot of work still to do with LinkedIn. We’ve built some things we liked but we’re working on a lot more. I hope that eventually maybe it will be a clone of my brain. I do think that each of these networks mirrors to some degree their founders. For example, I am very focused with how professionals manage their careers, leverage, and work together to collaborate in order to be more effective. Other networks are more heavily oriented to dating or heavily oriented to college buddies. . Each of these actually are designed by the aspirations of their founder. Kamla: Talking about aspirations, let us switch to India where there is a huge aspiration revolution going on with the mobile phone. LinkedIn is right now available for desktop users. What plans do you have for LinkedIn in India, keeping in mind the mobile revolution and the number of people that are switching to mobile? Reid: One of the challenges for LinkedIn is because it is information rich apps. We currently have a profile which is very thick. The kinds of things you search for - you search for – who do I know who works at eBay. Or, who is an expert on open source or is there someone around me who is doing an interesting startup or something like that. So these tend to have information rich applications. Now we are interested in mobile because of a bunch of different users. We have an iPhone app that we just launched. We are generally working on more high-end phones because ones where typing in text and being able to look at the search result are the things that matter. And in those phones, we have actually viable interfaces. We go to m.linkedin.com, there is interesting stuff there. There is an iPhone app. We will deepen this because for example- who do I know who is at this conference? Or, who should I meet at this conference? These kinds of things are the kind of things that LinkedIn will build out its functionality for. We are quite aware that many people, not just India but India especially, have their computer as a principal electronic device to the web and so we need to make sure that we iterate our services to be good to those interfaces. Kamla: What is your definition of social network? Reid: Social network is a set of real people who the network connections online mirror what is in truth. So for example, Bob is really friends with Cindy or Fred really knows Joe or Michelle really knows Sarah. And on the social side of it, these are my friends and these are people the people I’m connected to, etc. On the professional side, these are people I know and trust enough and I’ve worked with them. And on a case by case basis, I would introduce them to other people. Kamla: And what values are you trying to create through your social network? Reid: In the professional space especially, people can help each other a lot. With a little bit energy from me, I can be massively beneficial to one of the people I am connected to. So it’s not just me but that is everybody. So for example, if I write an introduction to an interesting new opportunity, the ability to provide information on a challenge or task we are trying to solve. So LinkedIn is trying to make it so that it is much easier. It is to have all the benefits of a network without really networking where it’s much easier to collaborate with people that you have established a trust relationship with. So take for example, all the way down to the young folks, its like – well one of the things is like the professors or one of the recently graduate classes- let us say you are a senior in college and some of your senior friends just graduated into the workforce and you are connected with them on LinkedIn. Well that connection can help you get into the workforce, identify who are the interesting people to talk to and what are the interesting opportunities and that sort of a thing. And those are the kinds of value propositions that LinkedIn tries to ride. We don’t do social; we don’t do “where’re you partying on Friday night" or “which restaurant to eat at". We do “what matters for your career and what matters for solving your professional tasks". Kamla: So you have this theory of "small good"? Reid: Yes. And basically the idea is- as a person if you can do a small good for someone else, which can be massively good for them especially when it is in your community, your network, etc. You are creating a lot more value into the system. Kamla: So now, let me tie in everything that you have said. You have defined social network, you have defined what LinkedIn does in terms of value, you have defined what is the small good. Now, let us go back to India and look how relationships matter in India. Kamla: And if the computer is not the active primary device for them, how then is LinkedIn planning on growing in India? You have got one million users out of a population of over a billion. Reid: The network is the representation of real people with an identity, with an electronically addressable communications device. Now the primary use of LinkedIn thus far has been a PC and e-mail address. But obviously natural extensions are to a phone number because that is also an identifier to a person. And as long as we can get the information interface rich enough then you have profiles, your searches and post questions and get answers and help other people get answers. As those interfaces are available, those are the things that we will be extending into the mobile. Kamla: So as Head of Product Development at LinkedIn, I am going to come back to that question again. How are you going to going to stay relevant to generation Y and generation Z? Reid: Actually I don’t know if generation Z is that a common term yet? Kamla: Maybe I just invented it. Reid: So the hope is that we stay relevant because the thing that actually makes a professional effective and makes their careers for all ages, be it a 21 year old, 18-year old and a 40-year old or 60-year old, is the network of people around them, that they’ve established the trust relationship with. That is where you get best opportunities, that is where you get your best leads, that is actually your help in solving problems. LinkedIn is about being able to make it easier and natural to collaborate with those people. And that is as relevant to a 21-year old today as it is to a 21-year old, you know- than a new 21-year old five years from now when this 21-year old is 26 and the new one is 21. We have to adapt ourselves to new interfaces. So, for example with the mobile coming we have to make sure that we are providing the value propositions that allow you to collaborate and coordinate with your network in order to be effective in your career and tasks. But I guess I would say the following bold statement: that as long as there is work, we should be relevant. Kamla: Again, staying with India, they tend to be very geeky, tech-oriented-the young people. What about introducing APIs and having people develop applications for you in India for LinkedIn? Reid: Well, we do have plans which we have been working although we have not announced a specific date on for releasing a platform on the website-that is in the not too distant future. And our goal will be to have a platform where people can build new kinds of business apps on. Now we were going to be very careful about how we allow and enable apps on it because it is very important to us that we keep to our professional knitting. So, for example, if someone were trying to launch a dating service on LinkedIn, we would actually just forbid it and part of reason of that is like you know, for example for someone who is married, it’s perfectly cool to be on LinkedIn. There are no dating components. There is nothing that would make their partner think weirdly about what they are doing on LinkedIn. So we will be careful about what we approve, but the idea would be to allow a number of different parties-- LinkedIn and parties other than LinkedIn to develop applications on the LinkedIn platform. Kamla: Here is a question that I got from somebody in India. They say that if one compared MySpace, Facebook and LinkedIn, each seems to have found a space and an audience of its own. How much of this was strategic calls that LinkedIn made very early on and how much of it is a work-in-progress? This person wants to understand the release process and I guess, is a product development question and this is something that would be very relevant for a lot of Indian listeners. Reid: So from LinkedIn perspective, it was very deliberate from early days. Because I invested in Series A and Friendster the same time I was starting with LinkedIn. I hadn’t invested in Facebook at that time. So I thought Friendster will be social and LinkedIn will be the professional. Those two need to be very different. For example how do you want to present yourself in a dating context? I want be fun. I am bold and attractive etc. These are not how you want to present yourself on a professional context. How you want to present yourself to your prospective or your current boss, colleagues, etc. And we made a very distinct-deliberate distinction to keep them separate. Now the metaphor that I frequently use when we are talking about the three current giants’ is: MySpace is the bar, Facebook is home and LinkedIn is the office. Kamla: So there is got to be some commonality between the three? Reid: In fact that is a part of the reason for this. For example, are there people that you are friends with, they are also who you work with? Absolutely. There is some overlap. But what you do there, how you present yourself, what is the set of activities, what are the things that you are trying to accomplish are in fact different in each of these three places. Kamla: What are some of the major features that we can expect by the end of 2008, that maybe relevant for people outside of the US? Reid: We are building features on a global network so hopefully they are relevant to everybody. That is the least what we aspire to do. We have some great new releases and groups coming. We have already made some releases in the last few days but there are more coming on that. We have some new interesting evolutions in the profile that we think will be helpful. Then we have some additional big releases coming but they are still under wraps from a PR perspective. Kamla: Have there been any interesting anecdotes that you could share with people? People have used LinkedIn in very surprising ways. Reid: The first one and this is what is one of the delights about creating a tool. The first one that totally stunned me was in 200 4. What happened is- I don’t know this but I just heard about it through a testimonial-this engineer moved from Silicon Valley to Denver in the United States and he was trying to decide which company he wants to work for. And so what he did is, he searched for other people like him- like who had his interest, his technical interest, his technical skill-set and he saw which companies are most beneficial to be worked at and finds three companies and that is interesting. And then he went and looked at the jobs and positions in those companies. I was like- wow that is actually a clever application of people search, which I hadn’t thought of. Where do people like me work because I want to work with other people that are like me and those are places where I could be successful and that was the very first one was “wow, that is interesting!" 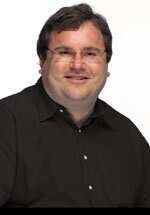 Kamla: You were listening to Reid Hoffman, Chairperson and President of LinkedIn. Tune back in for part 2 of our conversation where Reid talks about technology and entrepreneurship. This is Kamla Bhatt. This interview was brought to you in association with Live Mint Radio. And as always, thank you for tuning in.